Tags: idle, champions, early, access, update, spotlight, aila, katie morrison. Her eyes narrow. The corner of her lips curl up into a smile so slight, it's barely noticeable. "What did you say?" She asks stepping forward. Her hand instinctively reaches to her warhammer. The air around us electrifies instantly. "Here we go again," I say as I reach for my weapons. "What?" She turns around, smirking openly now. "I'm a delight!" She laughs as her barbarian rage takes over and she jumps into the fray; lightning coursing through her Warhammer, the Howling Gale. Aila was created by Katie Morrison, a member of The High Rollers D&D crew, based in the UK. The High Rollers stream each week at the High Rollers Twitch page at 5PM BST, or noon Eastern every Sunday. You can also follow thair adventures on Youtube! For more info on Aila, the High Rollers crew, and the homebrew world of Aerois created by professional dungeon master Mark Hulmes, check out the High Rollers Aerois wiki. 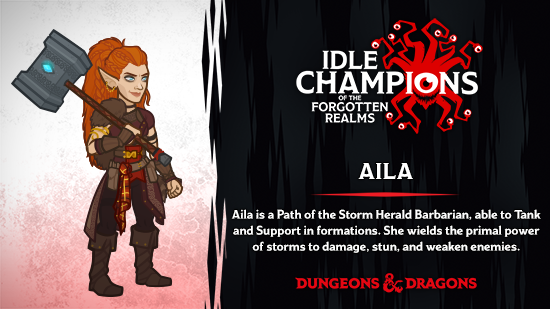 Aila is a path of the Storm Herald Barbarian, able to Tank and Support in formations. She wields the primal power of storms to damage, stun, and weaken enemies. When you want to add Aila to your formation, you can swap her with Makos (Slot 9). Aila was found in the lowlands of Aerois by the wild elf Airdeith clan. While she is also a wild elf, she hails from a long lost clan. The only clue she has to her past is the tartan that was found with her. When she grew older she began to realize that she possessed powers that most others didn't. When angered, her fingertips would produce lightning. She cultivated the strength of her ancestors, becoming the Barbarian that now travels with the Heroes of Aerois. She is stubborn, proud, and often very sarcastic. Wild elves in Aerois typically have Celtic and Viking themes which inspired Katie to bring her own Scottish roots into her character. The scrap of clan tartan became an important item and Aila's story was formed around it. The name Aila means "from the strong place" in Scottish Gaelic. 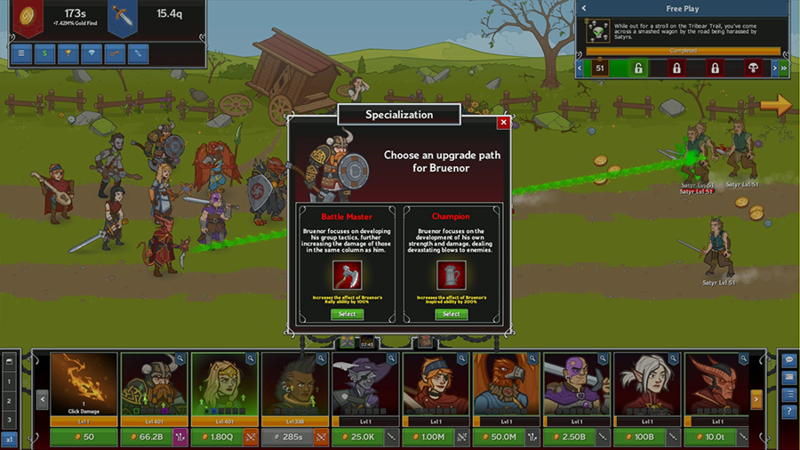 A fitting name for a barbarian! Aila's portrait and model were drawn by Alexis Theroux. Her equipment was drawn by Kat Crane! As always, they've done an amazing job and we hope all of you enjoy their efforts on Aila! 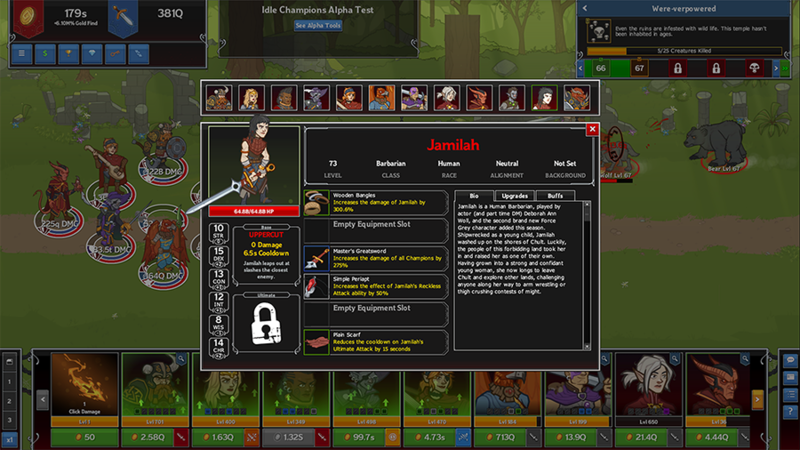 Aila attacks the nearest enemy with her warhammer, the Howling Gale, knocking them back slighlty with the gust cantrip. Before we get into her abilities, I want to talk about two statuses she inflicts on enemies: Primed and Electrified. Multiple formation abilities refer to both Primed and Electrified enemies. Enemies become Primed from Aila's Storm Aura. They become Electrified from her Storm Soul & Raging Storm abilities. Primed enemies take more damage from all Champions. 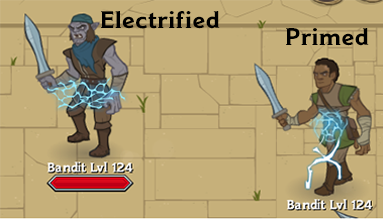 Electrified enemies take EVEN MORE damage! Primed enemies are shown visually by a small lightning ball overlay on their model. 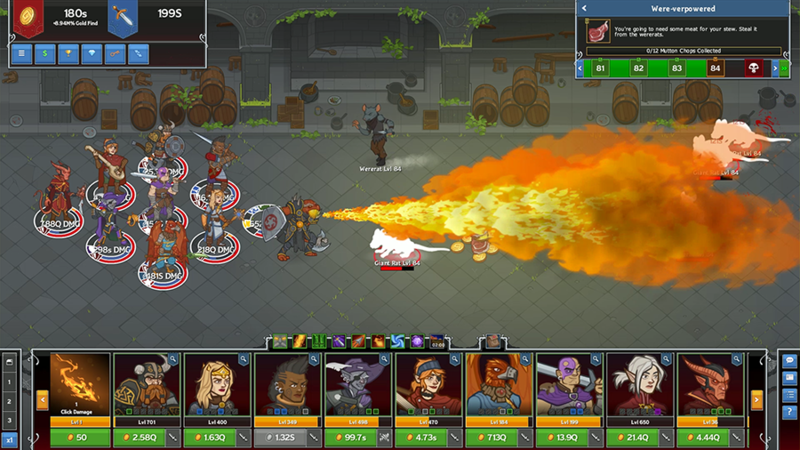 Electrified enemies are shown visually by a wreath of lightning around them. Storm Aura — Every 4 seconds a random enemy approaching the formation is Primed. Primed enemies take 50% more damage from all Champions. Heart of the Storm — Increases the health of all Champions by 25% of Aila's max health. Storm Soul — When Aila attacks a Primed enemy, they are stunned for 2 seconds and they become Electrified, increasing the damage they take from all Champions by a much larger amount for EACH Electrified enemy on screen! Raging Storm — When Aila attacks an Electrified enemy, all nearby Primed enemies become Electrified and then all nearby Electrified enemies are stunned for .5 seconds. Shielding Storm — When an Electrified enemy attacks Aila, she gains temporary HP at 10% of her max health for each Electrified enemy on screen. Stormcaller — Reduces the cooldown on Aila's Storm Aura by 2 seconds. Use this if you want to get more enemies Primed quicker! 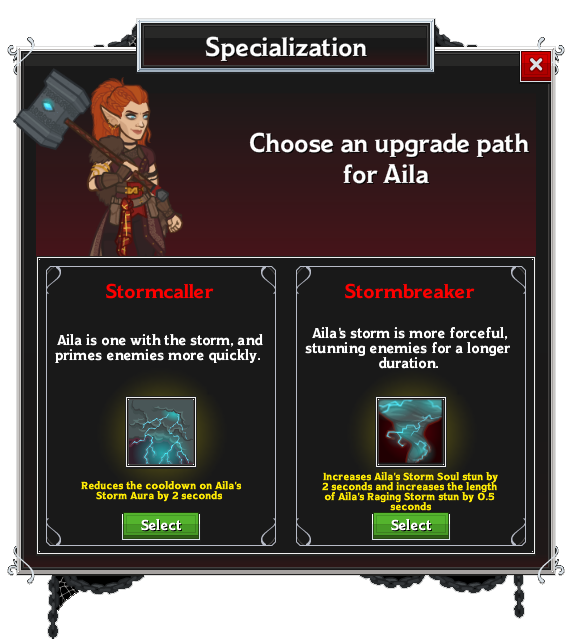 Stormbreaker — Increases Aila's Storm Soul stun by 2 seconds and increase the length of Aila's Raging Storm stun by .5 seconds. Use this if you need to hold enemies back longer, allowing your DPS Champions time to clear them out! Storm Herald — Aila lifts her Warhammer high into the sky, calling the lightning and unleashing the power of her ancestors. Once her warhammer is charged with lightning, she unleashes it across all enemies, damaging and stunning them for 5 seconds. It deals 10% more damage for each Electrified Enemy on screen. Furs of the Stormbringer — As a barbarian of the lowlands, she's been raised to hunt. "Take what you can and leave nothing behind; it's the way of my people." Mr Snappy the Trap — Mr Snappy is always around if you need a quick meal. The Howling Gale — The warhammer given to her by the Airdeith, her adoptive clan. Heritage Tartan — She was found and raised by the Airdeith clan. The tartan she carries is the only clue to her past. Airdeith Clan Boots — "Just because I'm a barbarian, doesn't mean I run around with bare feet!" 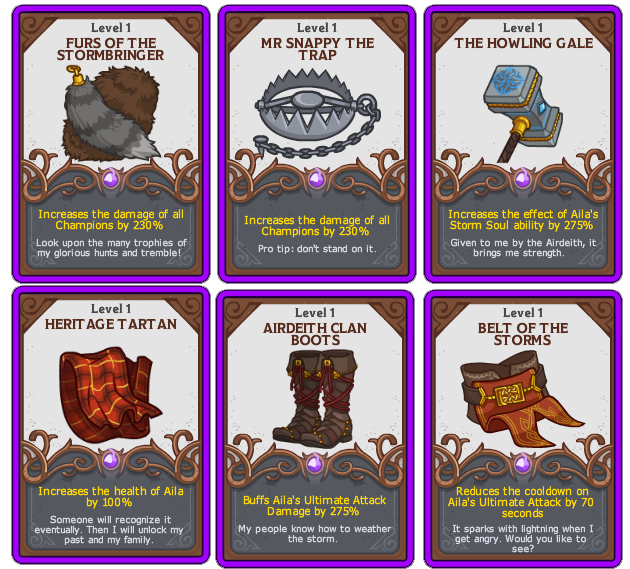 Belt of the Storms — Why have a simple belt when you can be awesome instead? 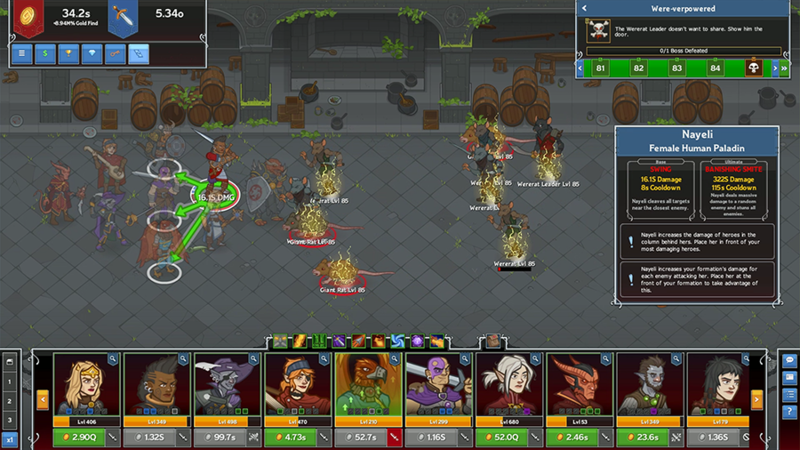 We are super excited to begin introducing the Heroes of Aerois to Idle Champions. If you enjoy the character, consider checking out their Aerois campaign on the High Rollers Twitch channel! 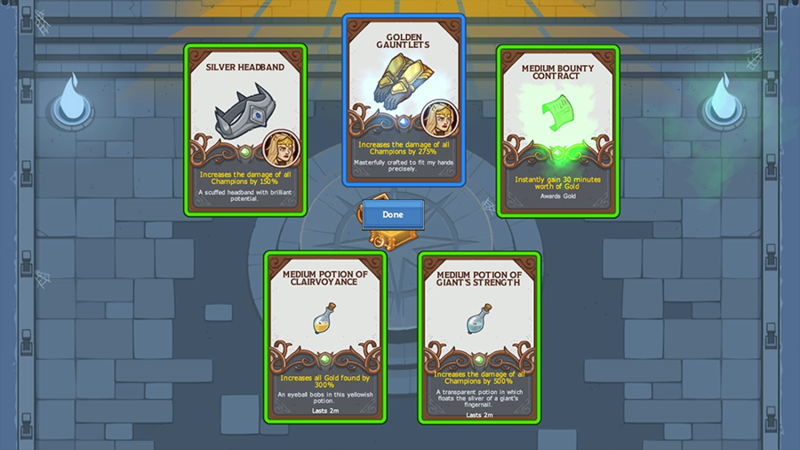 As always, feel free to send us feedback on via the Idle Champions Subreddit, Steam forum, or the Idle Champions Discord!